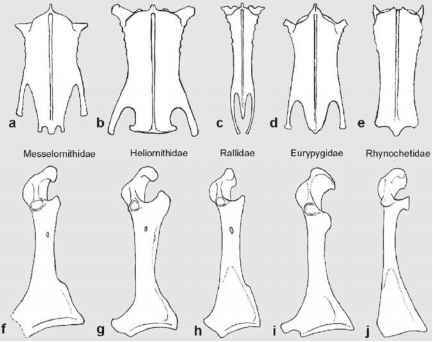 With over 500 specimens (Morlo 2004), the Messelornithidae (Messel rails) are the most abundant avian group in Messel, and these birds are also fairly common in the Green River Formation (Hesse 1990; Weidig 2003). The four species currently included in the taxon are Messelornis cristata Hesse, 1988 from Messel, M. nearctica Hesse, 1992 from the Green River Formation, M. russelli Mourer-Chauvire, 1995 from the Paleocene of France, and Itardiornis hessae Mourer-Chauvire, 1995 from the late Eocene and early Oligocene (MP 17-23) of the Quercy fissure fillings (Hesse 1988a, 1990, 1992; Mourer-Chauvire 1995b). Messelornis cristata, the best known species of the Messelornithidae, was the size of a Common Moorhen (Gallinula chloropus), and had long legs and a rather short beak (Fig. 9.1). The species epithet "cristata" refers to the fact that in one specimen Hesse (1988a, 1990) identified the remains of what she assumed to be a fleshy crest (see p. 242 in Feduccia 1999). However, after my own examination of this specimen, I am not convinced of this interpretation and rather assume that the "crest" is an artifact of organic matter lying under the beak. is well preserved, and it can be observed that the species had a long tail (Hesse 1990, plate 2, Fig. 5). The species appears to have been sexually dimorphic in size. Morlo (2004) described a skeleton of M. cristata which is preserved with the remains of the percoid fish Rhenanoperca minuta Gaudant and Micklich, 1990 in the area of the esophagus. The gut contents of other specimens of this species consist of seeds (Hesse 1990). 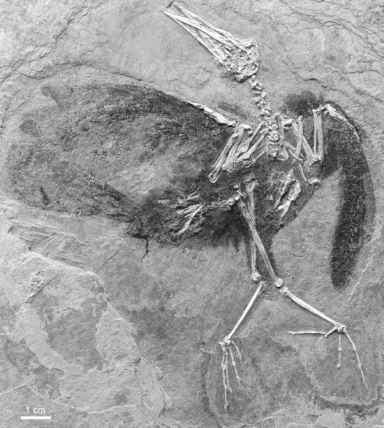 Fossils of M. cristata constitute about half of all avian remains discovered in Messel. Many specimens have exact stratigraphic data and can be assigned to particular horizons of the Messel deposits. Hesse and Habersetzer (1993) assumed that there exists evidence for an evolution toward increased perching capabilities during the sedimentation period of the Messel oilshale in the position and relative size of the hallux of the numerous specimens of M. cristata. However, this hypothesis has to be viewed with caution, as it is very difficult to reliably assess such subtle differences in Messel skeletons, many of which are considerably flattened and crushed. The Quercy messelornithid I. hessae is represented by most major limb bones. As in the species of Messelornis, the proximal end of the tarsometatarsus exhibits an ossified supratendinal bridge (arcus extensorius). I. hessae was, however, larger than M. cristata and M. nearctica, from which it is further distinguished in that the scapular articulation facet of the coracoid is shallow and not cup-like as in Messelornis. Messel rails were considered to be most closely related to the South American Eurypygidae by Hesse (1988b, 1990) and Livezey (1998). However, this hypothesis conflicts with the fact that they lack several of the derived characters shared by the Eurypygidae and their sister taxon, the Rhynochetidae (Chap. 3), most notably schizorhinal nostrils, a notarium, and a deep, U-shaped incision in the caudal margin of the pelvis (Mayr 2004c). In contrast to that of extant Eurypygidae and Rhynochetidae, the coracoid of messelornithids further exhibits a foramen for the supracoracoideus nerve (Fig. 9.2), and a sister group relationship between messe-lornithids and the clade (Heliornithidae + Rallidae) is better supported by the current morphological evidence. Derived characters shared by these taxa include the absence of pneumatic foramina in the proximal end of the humerus and a derived morphology of the coracoid and hypotarsus (Mayr 2004c). M. russelli from the Paleocene of the Reims area in France is based on two incomplete/poorly preserved humeri. Owing to its fragmentary fossil record, identification of this species is not uncontroversial. Although the humerus resembles that of M. cristata, it is also very similar to the humerus of Walbeckornis creber Mayr, 2007 from the Paleocene of Walbeck in Germany (Fig. 9.3). 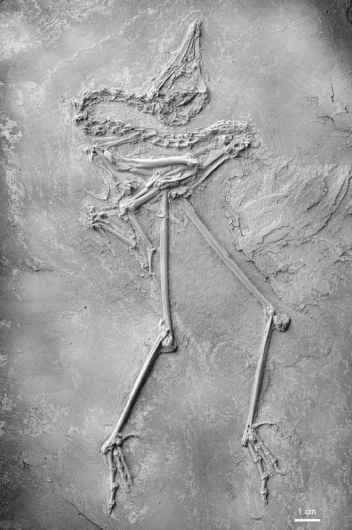 This latter species is the most abundant bird in the locality and is known from numerous three-dimension-ally preserved bones, which represent all major limb elements (Mayr 2007a). In particular, the humerus and coracoid of W. creber are very similar to the corresponding bones of the Messelornithidae, but the phylogenetic affinities of the species are unresolved (Mayr 2007a). W. creber has a much shorter tarsometatarsus than Messelornis, but there appears to be a second, unnamed species of Walbeckornis in the Walbeck material with a long tarsometatarsus (Mayr 2007a). As in Messelornis, the proximal end of the humerus lacks pneumatic foramina, although in contrast to that of Messelornis the hypotarsus does not enclose a canal for the tendon of the flexor digitorum longus muscle. in the description of the Walbeck species (Mayr 2007a), consists of a humerus shaft, a distal tibiotarsus, and a proximal tarsometatarsus, and was assigned to the Rallidae by Hou (1994). Direct comparisons would, however, be needed to evaluate the possibility of a closer relationship between Walbeckornis and Wanshuina.